An old Forest Service cabin, constructed by the Civilian Conservation Core in the 1930s, sits near Imnaha Springs in Southern Oregon. It’s a magical place where crystal clear water gushes out of mossy ground to form Imnaha Creek. Now available as a vacation rental, the cabin’s location is idyllic. Lush monkey flowers and miners lettuce line the stream banks, and the sound of gurgling water fills the forest. Lovely as it was, my dad and I didn’t linger. 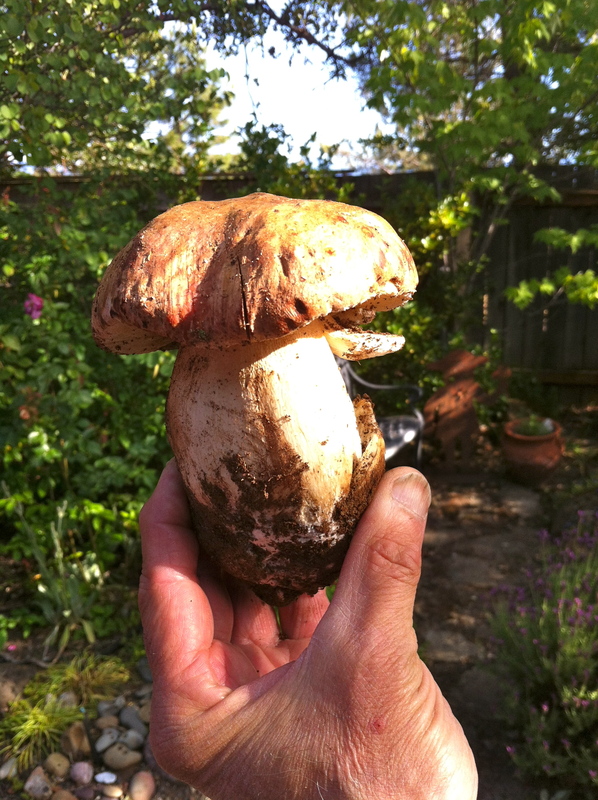 We’d come on a mission – to find King Bolete mushrooms. Kooky mushroom expert David Arora calls them “the consummate creation, the peerless epitome of earthbound substance, a bald bulbous pillar of thick white flesh – the one aristocrat the peasants can eat!” If you’ve sampled this mushroom, you might find such effusive descriptions are apt for King Boletes, also known as porcini. Firm, meaty, with an earthy aroma, they are absolutely delicious. Unfortunately, little grubs and animals think they’re delicious also; sometimes fresh mushrooms are riddled with bugs. We didn’t find a bounty of boletes, but the one we brought home was absolutely perfect. The real excitement of the day, however, wasn’t of the fungi variety. Eyes trained at the ground, searching for mushroom caps, I was more focused on the forest floor than usual. A small spot of softness caught my attention. Can you see it? 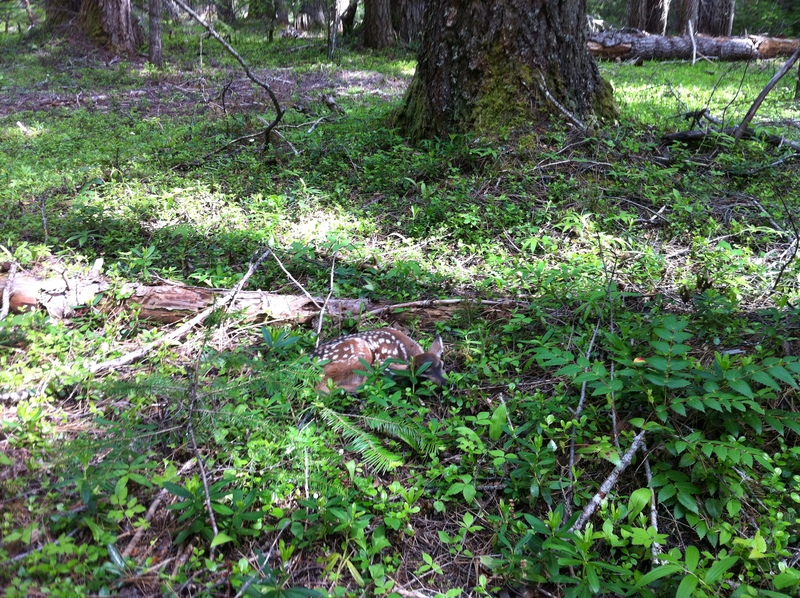 A tiny fawn, no more than a week old, lay curled in the undergrowth. 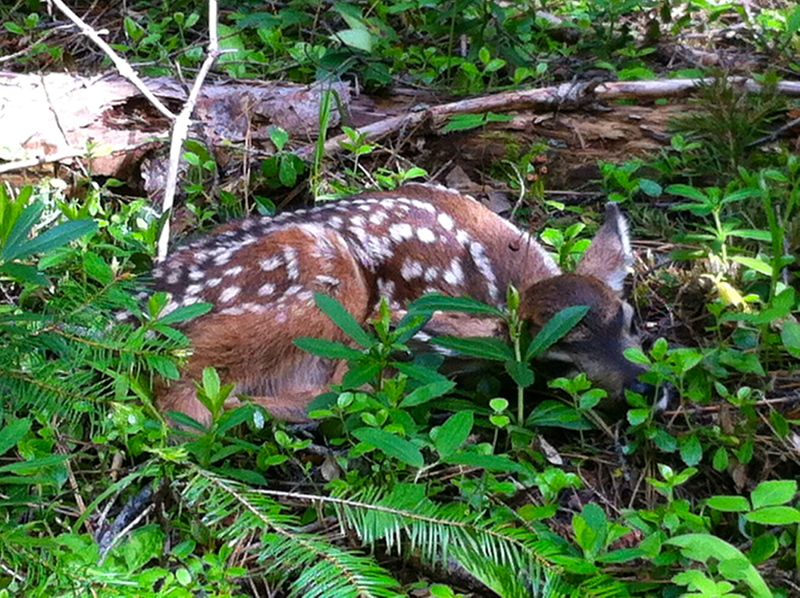 Young fawns rely on their spotted coat and stillness to hide from predators. Had I been simply hiking, I certainly would’ve walked right by. I’d never seen any living thing be so utterly motionless. We stared through binoculars, trying to discern whether or not it was breathing. We thought we saw movement in its small body, but it was so hard to tell. We waited for the little thing to blink. To twitch an ear. Nothing. Finally we moved on, trying to find a few more mushrooms. Thwarted, we circled back to see if the fawn was still there. This time I crept closer, and watched as the fawn took a big breath. I also saw it twitch its nose almost imperceptibly. 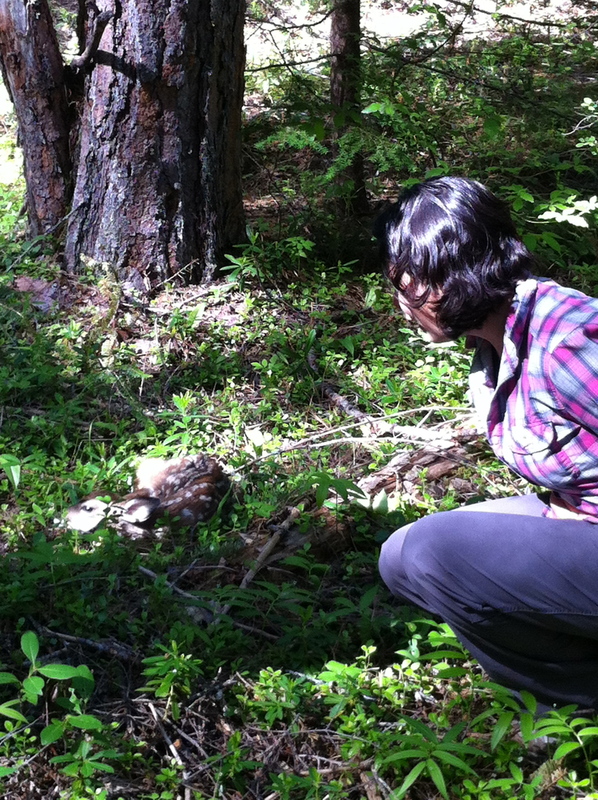 It’s easy to see how people think fawns are injured or abandoned; I easily could’ve picked up this tiny fawn. But the doe was undoubtedly somewhere nearby. The fawn was simply acting on survival instinct to remain still and wait for its mother to return. It was incredible to be so close to something wild and beautiful. 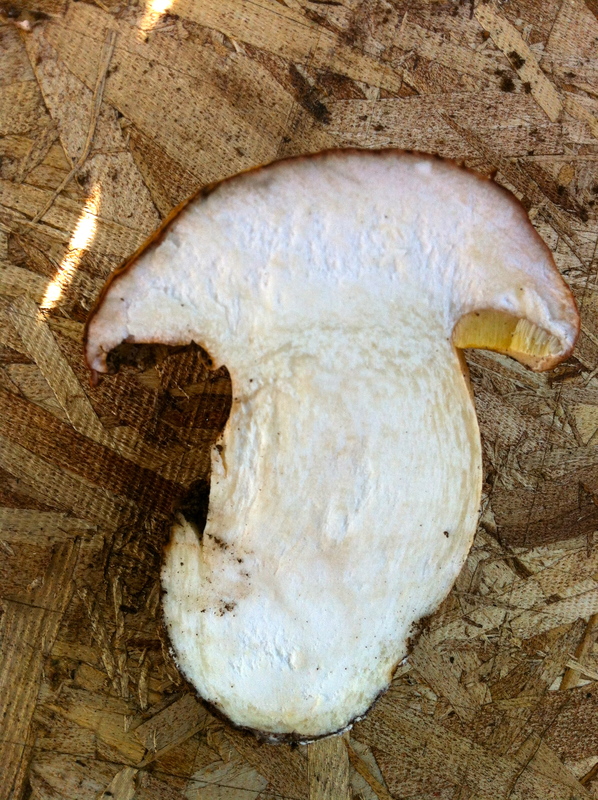 Our single King Bolete was quickly sautéed with butter and viognier, an elegant addition to simple rice bowls. 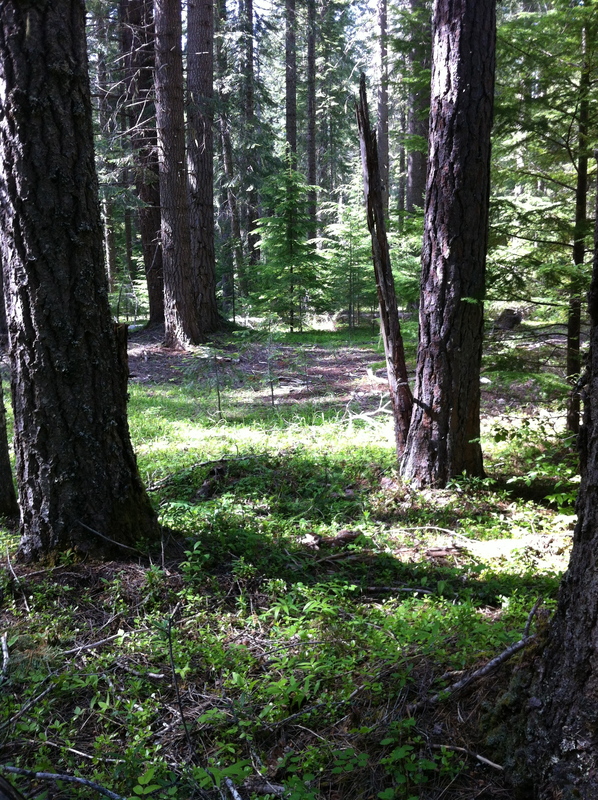 We kept talking about the fawn, our thoughts on a small, dappled body in a spot of green. This entry was posted in Adventures, Food & Farmers and tagged adventure, foraging, wildlife by Propane Kitchen. Bookmark the permalink. How cool was that? Nice post.